There have been lots of people throughout history to admire and even emulate. But that number quickly dwindles when we start talking about those that inspire. To inspire means to fill with the urge or ability to do something. To animate. So often it is easy to look on from afar and think, ‘Wow, that person is great.’ But how often are we so prodded in our hearts, that we change the way we act or think? It’s rare. 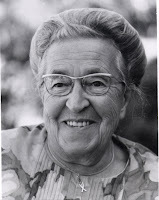 I was a teenager when I first read Corrie ten Boom’s story. She wrote several books. The one that first came to my attention was The Hiding Place. It is now a masterpiece of Holocaust literature. In it she recounted her experiences during World War II. above their shop at Barteljorisstraat 19 in Haarlem, Holland. Her parents planted in her life a vital faith, a spiritual legacy that would stand her in good stead. 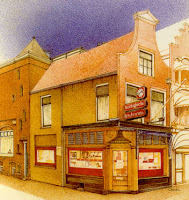 In 1922, Corrie became Holland’s first female watchmaker. She also began a religious girl’s club that eventually became the very large Triangle club. She drifted comfortably into middle-aged spinsterhood. She and her elder sister Betsy never married, and they stayed securely at home caring for their now widowed father and the family’s shop. And then the Nazis invaded. Their involvement with the Dutch resistance movement began as an act of love. They helped a neighboring Jewish family. And then one day in 1942 a well-dressed Jewish woman appeared on their doorstep carrying a suitcase. She was distraught. Her husband had been taken away months before. Her son had gone into hiding. The German authorities had visited her again recently and she was too frightened to return home. But rumors had reached her of the kindness they offered to their neighbors. Life was never the same for them again. At that moment, Corrie’s family was confronted with the chance to avoid involvement and remain safe, or to risk everything for the sake of a complete stranger. They chose the path of grace. They chose the path of sacrifice. They ushered the lady into their home. Casper ten Boom’s response to the lady was that in his home, God’s people were always welcome. As the rumors spread, Corrie, Betsy and Casper began to be visited by more refugees. They welcomes each one, treating them as honored guests, and even made a point of cooking Kosher meals and keeping the Sabbath. Soon they were deeply involved in the resistance movement. An architect involved in the Dutch resistance came in and built a false wall in Corrie’s room. And thus the hiding place was born. It was small, the equivalent of a medium sized closet. He designed it so cleverly that the Gestapo never discovered the secret room it created. Throughout their time as underground workers they sheltered Jews, resistance workers, and anyone else who fell afoul of the Nazi’s. They are credited with saving over 800 lives. They had plenty of room in their house, but they had to rely on God to provide the means to feed and clothe their visitors. And He did not fail them. Corrie had made many contacts through her charity work. When she humbly went to a contact to beg for extra ration cards she opened her mouth to say five and instead asked for 100. And got them. In February 1944, it all came crashing down. A Dutch informant betrayed them and their home was raided by the Gestapo. Thanks to regular drills, all of their guests made it to safety in the secret chamber, but the Ten Booms weren’t so lucky. The Germans found extra ration cards and resistance materials in the house, then they laid a trap and arrested anyone who came to the house that day. More than thirty people were captured, but all were released within a few days, except for Corrie, Betsy and their father. They were sent to Scheveningen prison and due to the terrible conditions, 86-year old Casper, died after only ten days of incarceration. Corrie and Betsy were moved to Vught concentration camp, and then as the war went badly for the Nazis they were marched to the infamous Ravensbruck concentration camp in Germany. If it had been me I would have just asked God to end my suffering quickly. But despite their situation, Corrie and Betsy found new faith. They affected the lives of hundreds of prisoners. When Corrie prayed for and received a New Testament, she used it to hold Bible studies with the other inmates in their barracks. They prayed for the lice to continue, because it kept the guards from entering their barracks. When Betsy was sick, they managed to obtain a little bottle of cough syrup. Betsy made Corrie give some to other sick inmates, even when she wanted to horde it for her sister. The medicine never ran out. Corrie was released just two weeks later on New Year’s Eve. She found out later that it was due to a clerical error. A week after her departure from the camp all of the women her age were slaughtered. After the war, Corrie traveled all over the world, speaking of her experiences, but more importantly, what she learned because of those experiences. Israel planted a tree in her named her one of the Righteous Among the Nations. The queen of the Netherlands knighted her. him to everyone present. To see him get his just desserts, but instead God gave her a little more grace and the rage lifted. She was able to forgive, and to take that man’s hand. Through it all she acted with a breathtaking humility and simple belief that there was no other way that she could have behaved. In 1971 her tale was made into a movie, The Hiding Place. She passed away in 1983 at the age of 91. I’ve wondered my whole life whether I would be strong if faced with some great trial. Corrie’s story inspires because she was so very ordinary even in her extraordinariness. God’s grace is not a one-time event extended to us only at the time of our salvation. No. His grace will meet us at the point of our need. That was her testimony, that there is no circumstance so terrible that it lessens God’s goodness. Even in the worst possible place He is still sovereign. He weeps with us, and though we don’t understand why we must suffer, He will give us beauty for ashes, the oil of joy for mourning, the garment of praise for the spirit of heaviness. I don’t know what situations you face right now in your life. But take heart, God does. He knows and more importantly He cares. If you haven’t read The Hiding Place, I more than recommend it. The movie is incredibly moving as well. They are both available on Amazon. I’ll leave you with this interview that Corrie did with Pat Robertson in 1974. It’s a little long at just over 7 minutes, but I think it is worth it. Thank you Lisa. I especially enjoyed the interview. How cool that we can now jump on youtube and see famous saints. This really made me think of the refiners fire. When we face hard times it reveals what is deep inside of us. It's a beautiful thing, because I imagine many or the quietest most unassuming Christians have the strongest hearts. I was so thrilled when I found this clip. Doesn't she have the most beautiful voice, and just an aura of peace. In the Sunday school class I help teach we discussed attitudes. Proverbs says that the person who controls himself is stronger than the man who can conquer a city. And the person who has no self-control is like a city with broken down walls. In other words, anyone can take control of it. Middle aged, spinster, non-athletic, Corrie was stronger than the Nazis because though they could control her body, they could never control her spirit. I think sometimes that is what forgiveness is about. It does more good for us than the other person. Forgiveness means taking back control of our 'city' and robbing them of the power of control over us any longer. When my stepfather worked for the Billy Graham organization, my mother got to spend an entire week with Corrie Ten Boom. Thank you for the reminder of something I don't often think about--that Corrie Ten Boom prayed for me when I was a little girl. I've always believed that prayers are what protected me in a very dark time in my life, when I left God behind. Who know, perhaps the prayers of that special lady impacted me twenty years later and long after Corrie had gone to be with the Lord. Oh, a post that reminded me of a wonderful encounter with Corrie Ten Boom, where she shared her "darkest trial" in the poignant way you capture here. This era of history fascinates me and, Lord willing, will become fodder for a fifth novel...Sigh. Keep going, fingers. Keep going. Wow, Laurie Alice. What a privilege. God hears all our prayers, I know. But I think sometimes that there is a level of faith that comes only from experience. Corrie had one of those faith trees in her life, it had long ago grown from a seed. It's cool to think of how our prayers can effect the world even when we've passed from it. Patti, I'm intrigued. This era fascinates me as well. I can't wait to read what you create. Keep going, fingers, keep going! I think anyone should take the time to read about Corrie Ten Boom. It is truly God's grace in her life during WWII and after. I read this earlier and now at work, I don't think I want to watch the video until I'm alone again. What a great choice, Lisa. Wow. I love the book, the movie and the song "You are My Hiding Place" chokes me up every time. An amazing story. And to hear the personal stories of Laurie Alice and Patti-- That's incredible! I often think of the Ten Boom sisters when I am fretting about being too cold, or hungry, or tired. She certainly is an inspiring woman and by going beyond what seems impossible, we can see the work of God in her life. That book had an amazing effect on me. What a faith-builder! Thanks for reminding me of it. Thanks for stopping by Linda and RObin, I had a feeling I wouldn't be the only one to remember her courageous story. You're right, Deb, God had to be at work in her life. I can't imagine that she would ever have dreamed at the time she became a watchmaker, that God had much bigger plans for her. I have read 'the hiding place.' What an inspirational life story of Corrie Ten Boom and her family. I also read her devotions daily from her book "each new day." Thanks for sharing the interview w/ Pat Robertson. Beautiful, Lisa. I was so moved, even though I'm familiar with her and I've read "The Hiding Place" -- this is so powerful. Our God is awesome, and she was a mighty servant. Wow! Lisa, that was incredible. I've heard Corrie speak via Focus on the Family before, but I've never read the book. Probably because I don't know if I can cope with the sadness. When I was in college we studied Nazism and the events of the Holocaust. It was difficult to handle. I'm a strong person (because of God) but I would never have wanted to be tested in the fires of the Holocaust. Of course nobody wants to be tested like that, but sometimes we have no choice. I'm a HUGE FAN of Corrie ten Boom! I think I've read all her books, all the accounts of her life. She's awesome. A true heroine. Karen, I've never read her devotions. I definitely need to track that one down. I totally understand where you're coming from Jill. One thing about Corrie's story though, that is different from most is that redemptive thread. Despite the tragedy there was hope. It's like the difference between Christian and secular novels. The spiritual thread makes the story complete and the darkness bearable. You're right Susanne. She was mighty. Not in the physical sense, but I bet there are few stronger warriors in the spiritual realm. Melanie, so glad you stopped by the Inkwell. I just want to hug your neck! Lisa, what a beautiful post! I love the pictures. I remember watching the movie about Corrie Ten Boom's life shortly after I came to the Lord. What an inspiration to us all. She faced such evil in her time, and yet remained faithful to God and obedient to His direction. Thank you for sharing this! Thank you, Lisa. I'm familiar with Corrie but I didn't know how much of her life I was missing. You've written an excellent post. Such a tribute to this gracious lady. I'll keep my eye out for The Hiding Place. Thanks Niki, you summed it up nicely. And Anita, you won't be sorry if you track down The Hiding Place. I find myself thinking about it periodically even though it's been years since I've read it. Thanks for reviewing this book and recapping this wonderful woman's life. She is a woman to inspire!